My feature on Oxford was in the Independent magazine last Saturday. If you didn't see a picture of my fat face eating ice cream, worry not! The full article is below. Oxford is one of those cities that feels incredibly familiar, from the moment you arrive. When you take your first steps through the streets, you feel as though you’ve walked them before. Colleges carved from thick stone appear around each corner, and clock towers and spires tower over tiny pathways and lanes. Girls cycle past, their wicker baskets filled to the brim with books. It could be the backdrop for any film set in a quintessentially English town. Of course, if you feel like you’re walking onto a film set, it’s probably because these streets have been used in countless movies and television programmes over the years. Fans of Inspector Morse flock to the Turf Tavern for a pint of ale, and Harry Potter enthusiasts trail around the city’s many versions of ‘Hogwarts’. 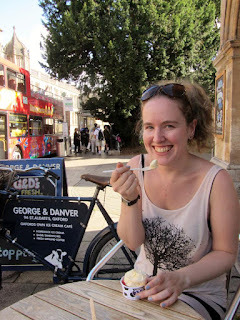 The best way to get a feel for Oxford is on one of the many walking tours offered by Visit Oxfordshire (visitoxfordandoxfordshire.com). A variety leave from their offices on Broad Street, all led by experienced guides. And they’re not just a generic hike around the usual tourist traps. You can choose from the ‘Children’s Stories’ tour, a walk of the ‘Gargoyles and the Grotesque’, or what’s known as ‘Magic, Murder and Mayhem’. I opted for the simple University and City tour, to get an inside look at some of the many colleges which are hidden around the city. The beautiful grounds of the various buildings draw crowds all year round, and it’s easy to see why. The presence of the University of Oxford is palpable with each step you take. Aside from the huddles of eager looking students who gather on each corner, and the plethora of book shops catering to their studies, a different college seems to pop up on every street. Most of these are open to tourists, but the times can be restrictive and changeable, even during the holidays. One of the advantages to taking a tour is not having to negotiate these times. You’ll also get access to areas that are usually out of bounds – my guide took us to the gardens of Exeter College, which I wouldn’t have noticed if I had gone alone. As a former student of the university and mother of two other graduates, she also provided a unique insight into college life. Walking tours can sometimes feel like an exercise in cattle herding, but in a town like Oxford, it’s worth it for the insider knowledge. I’d twice walked past a little doorway without realising that the lamp post just outside was the same one CS Lewis had looked at every day, before writing The Chronicles of Narnia. Just above the doorframe were two gold carvings, resembling Mr Tumnus. Without my guide, I wouldn’t have given either a second glance. When my official tour finished, I made my way to the grandest college in Oxford, Christ Church. Surrounded by meadows, Christ Church is one of the largest colleges, and probably the most popular with visitors. It’s also the most expensive to enter, with admission costing £8.50 (€11) in the summer, including access to the cathedral, quad and Great Hall. Surprisingly, there is an additional charge of £3 (€3.80) to enter the picture gallery. Christ Church is not only popular with fans of educational grandeur. Fans of Harry Potter swarm to the college to spot the locations used in filming – the grand staircase and Great Hall were both used in the first movie. On the day I visited, one girl had even dressed up as a character from the franchise, which brought the movie to life as we walked through the thick stone corridors of the cloisters. When leaving Christ Church, it would be difficult to ignore the George and Danver ice cream café, an Oxford institution just across the road. Open until midnight each night, the tables are packed with patrons, all tucking into delicious homemade ice cream as the spires of Christ Church stand tall overhead. Impressive as the college is, plenty of others compete in terms of aesthetic appeal. Trinity College is on Broad Street, with beautifully manicured gardens. Down the cobbled streets by the Bridge of Sighs, New College contains wisteria clad cloisters and an impressive chapel. You can visit Trinity throughout the year for £2 (€2.50) and New College for £3 (€3.80, though it’s free in the winter). 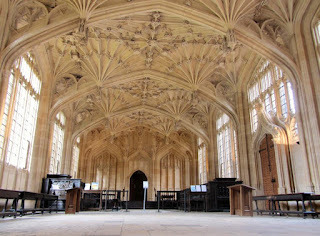 The Bodleian Library is a paradise for bibliophiles. A cluster of striking buildings surround a courtyard, through which students pass, laden down with battered books. Visitors can only see the interior of these buildings on a tour, which meanders past the dusty tomes of Duke Humfrey's Library and the Radcliffe Camera. Extended tours tiptoe through the restricted area and extended reading rooms, where antique books are pored over by scholars. However, after a morning of being guided, I was eager to explore a little on my own. It costs £1 (€1.30) to enter the Divinity School, and when the heavy wooden door closed behind me, I had the room to myself. My footsteps echoed around the walls, as I gazed transfixed at the intricate carvings of the vaulted ceiling. The solitude was refreshing, after exploring a city thick with tourists. It was time to escape the hectic city centre and explore the outskirts of Oxford. As the city itself is fairly compact, it only takes a short walk to be in the relative solitude of the countryside. As I made my way away from the Bodleian, the path soon met the Oxford University Parks, a sprawling field of green that runs alongside the Cherwell River. I walked alongside the water, keeping an eagle eye on the boats drifting past, and those steering them. Soon, I was to be one of them, and I had a sneaking suspicion that piloting a long ‘punt’ armed only with a lengthy metal pole was to be even more difficult than it looked. My suspicions were correct. I was joined on my punting trip by my friend Naomi, who steered us away from the Cherwell Boathouse after we had picked up our punt, pole and emergency paddle. After some shouted instructions from dry land, Naomi quickly got the hang of it. 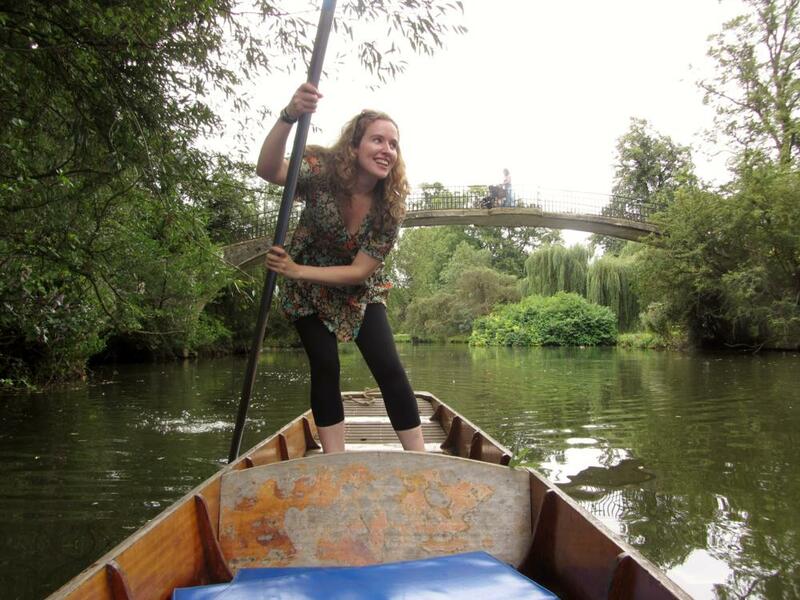 The pole is dropped through the hands to the riverbed where you push off, and the boat moves forward. You then lift the pole back through the hands, to drop it again moments later. We glided down the beautiful river, past swimming ducks and weeping willows, cascading into the water. After an hour of blissful journeying, I decided that it was my turn to do the work. The next ten minutes were spent frantically trying to avoid tree branches and mud banks, as I attempted to navigate the dead end I had somehow steered us into. Whenever I pushed down on the pole, we swung to the right and drifted straight into the riverbanks, where I would cower under the willow branches I’d adored so much a few minutes previously. My frustration only grew with each boat that sailed effortlessly past us. The occupants of one were even toasting each other with glasses of Pimms. As our boat gave another lurch and I nearly toppled into the waters, I admitted defeat and handed the reins back to Naomi. Back in my rightful place as pampered passenger, I lay back in the boat and thought of the people who had travelled this same path for hundreds of years. University dons walked along the riverbank, deep in conversation, as we approached the centre of the city. Only their caps and gowns were missing from this picture perfect scene, in a city where time seems to stand still. Aer Lingus (0818 365 044; aerlingus.com) fly from Dublin, Shannon and Cork to London Heathrow, with fares starting at €25.99 one way. Oxford is an hour and a half away, with regular bus and train connections. There are regular trains from London Paddington to Oxford, which take an hour. Book in advance at nationalrail.co.uk as fares on the day can be expensive. Advance tickets can cost as little as £4. The Buttery Hotel (0044 1865 811 950; thebutteryhotel.co.uk) is on historic Broad Street, with 16 charming rooms overlooking the spires of Balliol College. Double rooms from €133, including breakfast. If you’re looking for a luxurious stay, The Randolph (0044 844 879 9132; macdonaldhotels.co.uk) is the height of opulence. Rooms from €261. For a unique peek into university life, why not stay in one of the colleges themselves? Accommodation is available outside of term time and ranges from the basic to the luxurious. (oxfordrooms.co.uk) Rooms from €38. Visit the Museum of Natural History, where the full size dinosaur skeletons thrill younger children. In the summer, fun workshops and craft sessions are held. The museum will be closed for refurbishment in 2013, though the neighbouring Pitt Rivers Museum will remain open. Enjoy a pub lunch in the Kings Arms, in the shadows of the Radcliffe Camera. Stroll around the historic Covered Market and sample some of the best food the city has to offer. Climb the narrow staircase of the Carfax Tower for amazing views of the city and surrounding hills. Head to Modern Art Oxford and enjoy a great selection of contemporary pieces from their ever changing exhibits. Next to be featured is the French multi-media artist, Jean-Luc Moulène, whose work will be shown until November 29th.